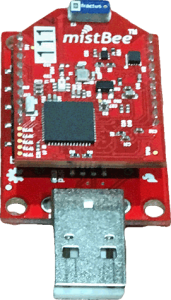 RSAE Labs offers two alternatives to interface mist® radio units via USB to Windows PC as a gateway or as an end-node collecting data from off-board sensor and data generating devices. The first is a PRU-USB standing for Primary Radio Unit. It offers the flexibility of an SMA connector to attach any type of 2.4 GHz antenna.